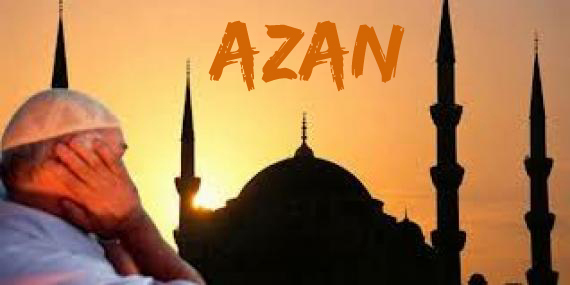 Azan (also called Adhan) is an Arabic word which has come from azn which means ear and Azan means to listen, to hear. Azan is given by muslim call to prayer times, recited by the muezzin at prescribed times of the day. Azan is called out by a muezzin from the mosque five times a day, traditionally from the minaret, summoning Muslims for mandatory (fard) worship (salat). A second call, known as iqama, (set up) then summons Muslims to line up for the beginning of the prayers. The main purpose behind the multiple loud pronouncements of adhan in every mosque is to make available to everyone an easily intelligible summary of Islamic belief. It is intended to bring to the mind of every believer and non-believer the substance of Islamic beliefs, or its spiritual ideology. In modern times, loudspeakers have been installed on minarets for this purpose. The azan recites the Takbir (God is great) followed by the Shahada (There is no god but God, Muhammad is the messenger of God). This statement of faith, called the Kalimah, is the first of the Five Pillars of Islam. The Holy Prophet Mohammad (SAW) said, stop doing everything during the Azan even reading the Quran, (and repeat the Azaan with the Moazzin.) The person who talks during the Azaan will not be able to say the Kalma-e-shahadat on his/her death bed. Amazing as it sounds, but fortunately, for the Muslims of the world, it is an established fact. 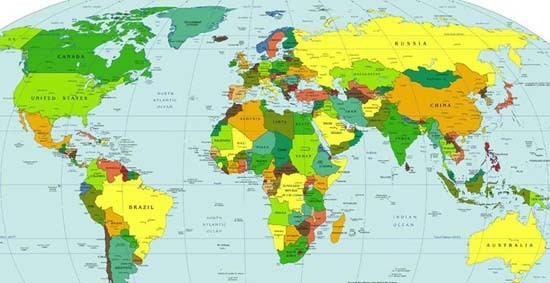 Have a look at a map of the world map of world. You will find Indonesia on the eastern side of the earth. The major cities of Indonesia are Java, Sumatra, Borneo and Saibil. As soon as dawn breaks on the eastern side of Saibil, at approximately 5:30 am local time, Fajar Azaan begins. Thousands of Muazzins in Indonesia begin reciting the Azaan. The process advances towards West Indonesia. One and a half hours after the Azaan has been completed in Saibil, it echoes in Jakarta. Sumatra then follows suit and before this auspicious process of calling Azaan ends in Indonesia, it has already begun in Malaysia. Burma is next in line, and within an hour of its beginning in Jakarta, it reaches Dacca, the capital city of Bangladesh. After Bangladesh, it has already prevailed in western India, from Calcutta to Srinagar. It then advances towards Bombay and the environment of entire India resounds with this proclamation. Srinagar and Sialkot (a north city in Pakistan) have the same timing for Azaan. The time difference between Sialkot, Quetta, and Karachi is forty minutes, and within this time, Fajar Aazaan is heard throughout Pakistan. Before it ends there, it has already begun in Afghanistan and Muscat. The time difference between Muscat and Baghdad is one hour. Azaan resounds during this one hour in the environments of Hijaaz-e-Muqaddas (Holycities of Makkah and Madinah), Yemen, United Arab Emirates, Kuwait and Iraq. The time difference between Baghdad and Alexandria in Egypt is again one hour. Azaan continues to resound in Syria, Egypt, Somalia and Sudan during this hour. The time difference between eastern and western Turkey is one and a half hours, and during this Alexandria and Tripoli (capital of Libya) are located at one hour’s difference. The process of calling Azaan thus continues throughout the whole of Africa. Therefore, the proclamation of the Tawheed” and “Risaalat” that had begun in Indonesia reaches the Eastern Shore of the Atlantic Ocean after nine and half hours. If we were to ponder over this phenomenon thoughtfully, we would conclude the amazing fact that there is not even a single moment when hundreds of thousands of Muazzins around the world are not reciting the Azaan on the surface of this earth. Even as you read this material right now, you can be sure there is Azan somewhere !! !